December 3, 2014, with an update on January 14, 2015. With those words, Mark Halseth reintroduced me to snow surfing, an old-school method of sliding down a snowy hill while standing up. 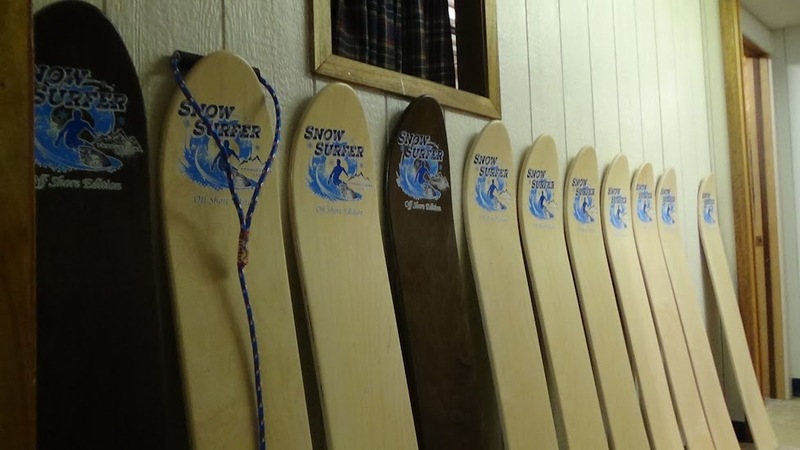 Look into the history of snowboarding, and very quickly you’ll encounter the Snurfer, the most famous snow-surfing board. The Snurfer, which a father built one day to entertain a bored child, quickly spawned a new sliding craze. Built in the snowbelt in Western Michigan, it was suited for powder snow conditions. But since it had no metal edges to grip into icy snow, or bindings to keep riders feet attached to the board, people soon started tinkering with it. Years of experimentation later, the Snurfer had evolved into the modern snowboard. Halseth was there in those early days, and he has the early Snurfer models to prove it. But more than a collector, he was “world’s first professional snow surfer.” In 1979, Halseth, his wife (“Boogie Jane”), and Paul Graves appeared in a commercial for Labatt beer, surfing down a field of powder. After decades in the auto-auction business, he decided it was time to turn away from the stress of corporate life. “One day,” he says, “I decided that to step out in faith and chase my dreams was worth the risk.” That decision led him back to the days of snow surfing. In recent months he’s been living the busy life of a start-up business owner, launching a new company to make and sell snow surfers. As we started our lunch at two o’clock in the afternoon, he confided that it was his first meal of the day. As we ate, he told me of some of the work involved: Pouring his personal finances into the business, talking to outside investors, developing prototypes of the products, making plans for marketing, contacting factories, and on and on. We reviewed some photos of prototypes and how they will differ from what’s on the market already. We also talked about what’s driving him these days. The surfing analogy is no accident. While Halseth is a Minnesota native, he spent much of his youth skateboarding and surfing in California. Even today, he speaks of “dropping in on our wave,” and sees snow surfing as a ticket to enjoying time with friends and family, exploring new hills, aided only by a few inches of snow and a free spirit. 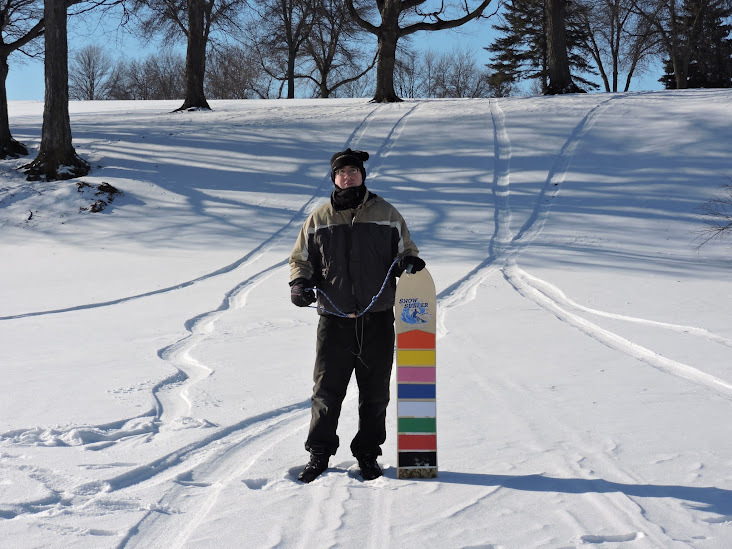 Snow surfing, he says, creates “memory maker moments.” Given its simple nature, snow surfing can be enjoyed on the smallest of hills: In some cases, all it requires is walking into the back yard. Simple, enjoyable family fun. But there’s more at work than a desire to see people grinning while sliding down the hill. He’s also driven by his Christian faith, which prompts him to see the boards as one way to reach youth for discipleship purposes, so he is teaming up with a youth ministry that has a skater twist. The two of us agree that too few children spend time outside, especially during winter. You can tell that he’s more of an outdoors guy than an indoors one. I mention the video game Minecraft–for which Microsoft recently paid $2.5 billion–but he isn’t familiar with it. Tucked away above a retail shop in rural Minnesota, the world headquarters of Snow Surfer Productions LLC could pass for off-campus college housing, only cleaner and without empty beer cans or pizza boxes. The first thing I see as I reach the top of the stairs is a cot and pillow, which no doubt comes in handy for a business owner working long hours. Mark Halseth, occasional cot occupant, takes me on a tour. There are several small rooms, one of which even comes with soft, cushy carpeting. One room holds a desk, laptop computer, and printer. 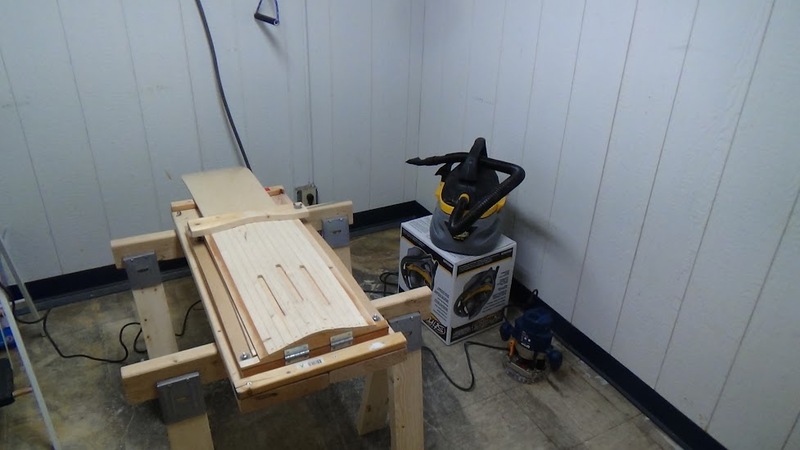 A wood router and vacuum cleaner sits in another, while the room in the back holds boxes and boxes of the foam (“Action Traction Pads”) that provides some grip for shoes. Snow surfing boards, some completely assembled and others not, sit propped up in a hallway, as well as across the room from the cot. Yet another room holds a few tools and assorted items. A yardstick, sitting on one work table, is so old that it displays the phone number of a business (long gone, no doubt) in the format that predates area codes. A large, luxurious headquarters, complete with lavish amenities, it isn’t. Then again, who needs an employee lounge or foosball tables when you can have a blast by driving a short distance away for some product testing? The boards come from a factory in the U.S. as slabs of wood that has been shaped for proper use. Superficially, they look like small, primitive snowboards. They’re small–120 cm from tip to tail, or 16 inches shorter than my alpine skis or snowboard, with a wood finish, rather than the standard plastic. The sole graphic, a 6-by-7 inch design of someone riding a surf on an ocean, is not garish or psychedelic–and therefore, not like what you’d find on most snowboards–and occupies only the slightly upraised nose of the board. Like some early snowboards, it has a swallowtail. It also has a camber; flip it over and place it on the floor and you’ll find a 2.5 inch gap. The board also has a shallow “v” in the back, much like some ships. But most significantly, there are no metal edges, which means they’re not meant for use at lift-served resorts. You could attempt to slide down a hill with the boards they way they are when they arrive from the factory, but they’re not yet finished. That requires putting a rope with a handle through a small hole in the tip, and setting some fins, each 7 inches long, in the base near the tail. The fins are there to provide some stability on hardpack, while the rope lets the rider control the direction of the board. As I witness the finishing work being done, I’m struck by how labor-intensive it is. Consider what’s required to attach the control rope to the board. Take PVC pipe and cut it to size. The small section of pipe will be the handle. Wrap the handle with foam for a better grip. Take a long piece of rope and cut it to size. Singe each end of the rope to help prevent fraying. Thread one end of the rope through the handle and double the rope back on itself, so that it forms a triangle, with the handle as the base. Place that end next to the rope, much like you do when tying shoelaces. Take a piece of metal and clamp the rope and its end together. With a pair of pliers, cinch the metal and rope together. 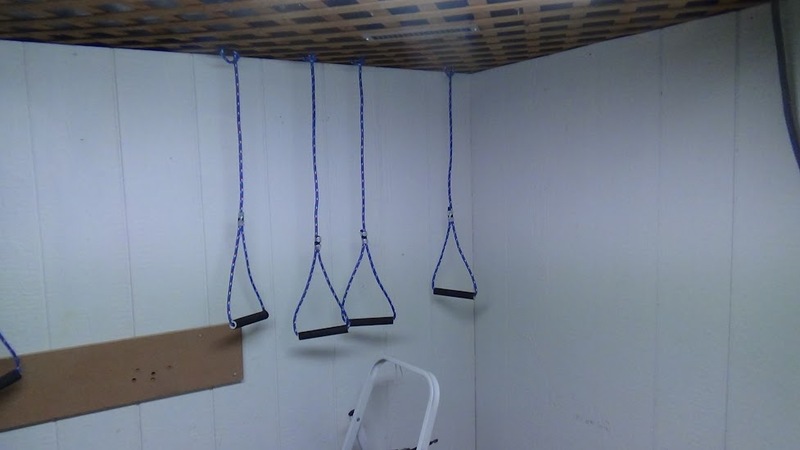 Take the rope, now modified, and place it on a hook on the wall or from the ceiling, to get it to straighten out. After waiting an appropriate amount of time, stick one end of the rope into a pre-drilled hole in the tip of the board. Tie that end into a knot. Add electrical tape to the leftover portion of the rope, on the underside of the tail. If necessary, make the rope shorter by creating a new knot on the topside of the board. Then there’s the matter of putting in the fins. Place the board face down on a flat surface. Mark the location of the grooves. With a router, create the slots for the fins. Apply epoxy and insert the fins. After these steps are done, the board is ready for delivery to the customer. But then the customer has a task to complete as well, which is to attach the Action Traction Pads to the top of the board. The pads serve two purposes. The first is to provide some traction. This is useful because there are no holes for bindings, and in any case, the board isn’t meant to be used with bindings. If you imagine standing on a slick piece of wood while sliding down a hill, you’ll appreciate the value of the foam pads, with their 45 raised bumps per square inch. The second purpose of the pads, which comes in sheets 8 inches wide by 36 inches long, is to customize the board’s appearance, much like skiers and snowboarders use stickers. The pads come in eight colors, plus camouflage, and two colors come with each board at no extra cost. To install a full pad, or portion of it, flip it over, draw a design with a pen or pencil, cut out the design with a knife, remove the pad, remove the backing paper, and put the pad on the board. You can cover up the entire board with a long, rectangular pad; you can install an intricate design, jigsaw-puzzle style; or you can take a minimalist approach, putting down only two patches, much like a stomp pad. Whatever you do, leave some gaps in the pad at the point where you expect your front foot to be. That, I’m told, helps improve traction and control. But enough with the factory-and-office tour. It’s time for some product testing. I get a briefing on the basics of using the board. Much like a snowboard, a surfing board is best ridden while in the “ready stance,” with knees bent. To turn the board, use the rope to pull up on the nose — “it flexes,” I’m assured — and do so in the direction you want the board to go. But there’s no need to overdo it; a gentle tug is all that is needed. 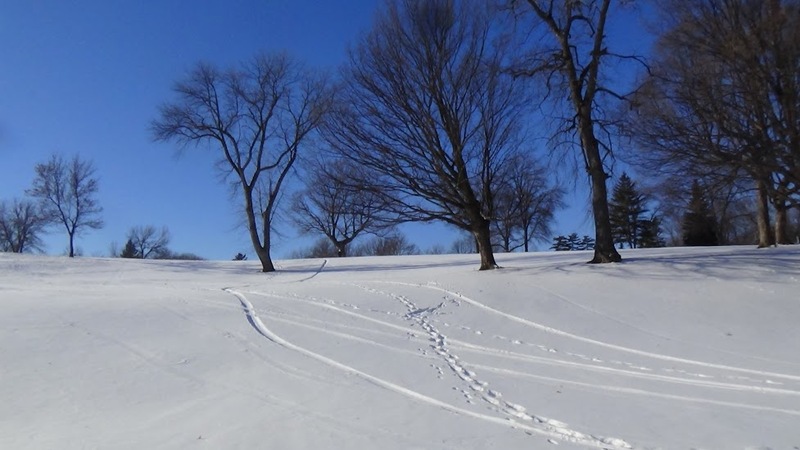 We put on our warm clothing — it’s about 5 degrees out — and drive to a local golf course. We start out with a point that any ski or snowboard instructor would recognize: If you’re going to introduce a new skill, start with easy or at least familiar terrain. Though we’re “only” on a golf course, we’re going to start out partly up a small hill, not on top it. I plop my board down on the ground, in an old track. Halseth places his foot, turned sideways, in front of the tip of my board. That’s my sign to stand on the board and get ready. He moves his foot out of the way, and I start sliding down the hill. It feels a bit uncomfortable, but I keep my eyes ahead, not down at the rope or my feet. I slide down the short drop, the ground flattens out, I slide a bit more, and then I’m done. It’s time to go back up the hill, and to my surprise, I don’t walk back up hill. I run. We soon develop a pattern: He lays down a track, I follow in it. Sometimes I stay in the track the entire way; sometimes I branch off. Laying down a new track has the emotional benefit of being “the first,” while riding in someone else’s track provides the benefit of increased speed. When we go back up the hill, we’re careful to follow in existing footsteps whenever possible. We seldom return to the same starting point; usually we walk higher up the hill, or to a new point entirely. On some climbs, I get winded and wait for a few minutes before heading back down. Riding on a chair lift can leave a skier or snowboarder cold, but as I walk uphill, I take off a glove and my hand feels just fine, ambient temperature notwithstanding. I have one tumble during our 90 minutes or so on the snow. It comes on the second or third descent. I was leaning back too far, with my weight towards the tail of the board. As any skier or snowboarder can attest, that’s not the way to slide on the snow: You need to embrace the challenge of the hill by having your weight facing downhill, not uphill. But the snow today is soft, so it doesn’t matter that I spill off the board. When the ground is flat and the snow is sticky, I draw on my snowboarding experience to move the board forward by shuffling my feet sideways until gravity takes over and I’m sliding downhill. At times I do get nervous: Will I lean so forward downhill that I fall over? (Unlikely.) What happens if I hit a dip or disruption in the snow? (Keep the knees flexed and ride it out). But I embrace the increasingly steep descents and keep going, one lap after another. At one point, I ride over the sitzmark I left on my tumble. With almost every descent, I set a new record for the length of descent. So what do you get out of the $100 or so you’ll spend on a Snow Surfer? Depending on your snow conditions and the terrain you have around you, a lot of fun. Let’s talk economics first. If this is your only form of sliding on the snow, you’ll save a bundle. There’s no need for snowboard boots or bindings (easily $100 each) and no need for a lift ticket, which even in bargain conditions starts at $15. Of course you won’t get snowmaking or snow grooming, which means that you’re at the mercy of what Mother Nature lays down. On the other hand, you won’t need much snow for it to work, and riding in variable conditions can teach you a thing or two about the intersection of snow and sliding objects. The lack of a chair lift means that you won’t be waiting in a lift line or put up with the lift attendant’s questionable taste in music. You won’t get oil stains on your jacket from the lift cables, and since you’re always on the go, you won’t get cold sitting still. And why pay $50 a month to a gym so that you can plod away on a boring “stair stepper” machine when you can get a better workout, in the sunshine? Another benefit of the snow surfer is that it makes enjoyment more accessible. I’ve touched on that when talking about finances, but even if you already own skis and snowboards, snow surfing can make the snow more accessible. It makes little hills look big, so you may find yourself making mental notes while driving about town: “That hill looks like a good place to try.” You may even be able to do some snow surfing in your front or back yard. Talk about cutting down on the travel time! For parents, snow surfers have extra benefits. They can send the kids off to the local park, so there’s no need to make a shuttle drive to a distant ski area. Parents can also give their children a low-cost introduction to sliding sideways down a hill. IS IT SNOWBOARDING? NO. IS IT FUN? YES! To be clear, snow surfing isn’t snowboarding. In snowboarding, you start a turn by changing the distribution of your weight between heels and toes, plus perhaps a movement of a knee or hip. In snow surfing, you start a turn by shifting your weight to the back foot, lifting up on the rope, and giving it a tug in the direction you want to go. People who start out sliding on a surfer and then try snowboarding will have to fight the learned habit of shifting their weight toward the back foot when starting a turn. They will also have to forgo the rope. But my guess is that in most cases, the adjustments won’t be a problem, and the rider will have gained so much from snow surfing. Here’s a 30-second video of me taking a trip down on the snow surfer. 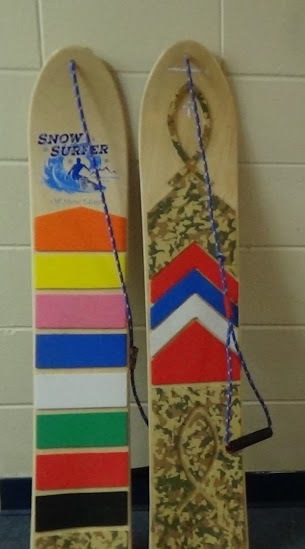 There are other snow surfing boards on the market. Here’s a list of some of them. I received one snow surfer as a gift for my daughter and purchased a second at the retail price for myself. John, Thank you for coming to the world headquarters, I really enjoyed it. Yes, the process of finishing snow surfers is very labor intensive but to me it is a huge blessing to be able to be following my dream and praying that the time and effort going into each board will produce 3M’s – Memory Maker Moments – like the ones that you and your daughter made yesterday. Thanks again and look forward to more pictures and videos!! Del, thanks for stopping by. Yes, I had the brown racing model (pinstrips, raised bumps) and the yellow one. Mark has many Snurfers in his collection, and a few of them are in his office. I should have compared the Snow Surfer to some of those Snurfers for length, width, and so forth, but did not. I have not had the chance to try the Mountain Surfer, or any other surfing board, for that matter. I’ve added a link (above) to another page that lists some of those boards. I’ve put in as many as I can find, but if you know of others, please leave a comment and I’ll revise the page. “Ride it like you stole it.” Yep, I do remember that!